Bindi Singh Kullar was born on January 11, 1976 in Richmond, BC. His family moved to Delta (Sunshine Hills) in 1988. Bindi attended Sunshine Hills Elementary School and continued on to Seaquam Secondary School. Bindi played many if not all sports while growing up in North Delta. He participated in track & field, basketball, soccer and football. Bindi was a top athlete receiving both team and individual awards throughout his involvement in school and community athletics. Bindi particularly excelled in Field Hockey. He was introduced to Field Hockey by his father at the young age of 7. 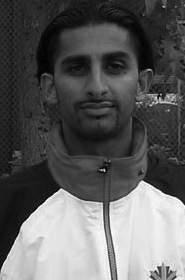 He has played at both local and international levels between 1996 and 2008 with the highlights being four World Cups, two Commonwealth Games, attaining a gold medal in 1999 and a silver medal in 2003 in the Pan American Games, and being a player for Team Canada in the 2000 Sydney Australian Olympic Games, and the 2008 Beijing China Olympic Games. During his playing career, Bindi represented Canada in 166 International matches! One of his most memorable experiences was scoring a goal against Germany in the 2000 Olympic Games in Sydney! In 1996 Bindi received the Premier’s Athletic Award at the B.C. Sports Hall of Fame for his outstanding accomplishments in Field Hockey. In 2008 Bindi was awarded Male Player of the Year for his many honors and achievements. Bindi has been an outstanding athlete and player, but now he is also giving back to the youth of the community. Bindi has not only dedicated his time to playing a sport he loves but has also devoted time to helping children understand the important role that sports can play. Developing life skills such as building confidence in one’s self and learning how to work with others. Bindi’s motivation and ambition have made him a role model for us all. Congratulations on being selected Delta Sports Hall of Fame Inductee – in the Athlete category.